Sukkot | "A Song Every Day"
Posted on October 11, 2017 by vspatz	in ancient ritual, Ethics, Exploring Babylon, God, liturgy, Sukkot and tagged #ThereWeSatDown, Ani Va-ho, Eleazar Kallir, Fanny Neuda, Hoshana Raba, Hours of Devotion, Machzor Rav Peninim. Prayers begging for rescue and mercy often take the format, “You helped them; help us.” The unusual aspect of this prayer, recited each day of Sukkot in Conservative and Orthodox Jewish liturgies, is its implication that God needs saving, too. Long before Eleazar Kallir (c.570–c.640 CE) developed this poem, however, Jews were teaching that God follows the People into exile. “These bold interpretations are a way of saying that when there is suffering in the world, God is not to be found on the side of the oppressors” (Or Hadash festival supplement; link below. 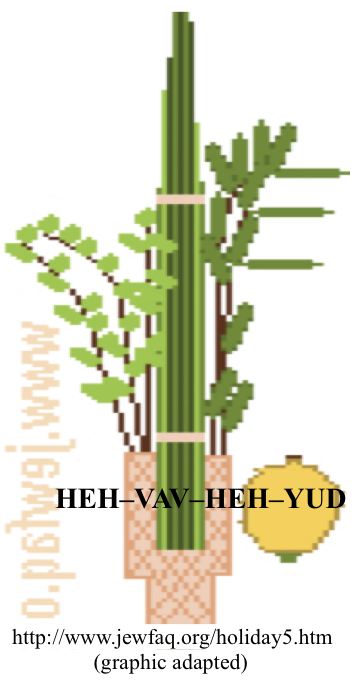 Click here for basics on ancient Sukkot practices). protect us, that our enemies not reign over us. and rescue us from captivity and from false imprisonment. Let no evil eye rule over us ever. Rebuild Your Holy Temple and restore your presence to Jerusalem…. Israel has been a wandering people. By unrest and the hatred of others. That we have not perished from the earth. You have allowed us to taste the sweetness of home. That recognizes us as its children. Along with all our brothers and sisters in this land…. The “homeland” Neuda had in mind was her native Moravia. The first edition of Hours of Devotion was published in German and included a blessing specifically naming Emperor Franz Joseph. Neuda’s family supported Haskalah, promoting the limited citizenship then allowed to Jews as well as sermons in the vernacular, modernizations of of prayers, and other religious adaptations that led to the Reform Movement. The prayerbook was later translated into Yiddish and was being reprinted in both languages up through the early part of the 20th Century. 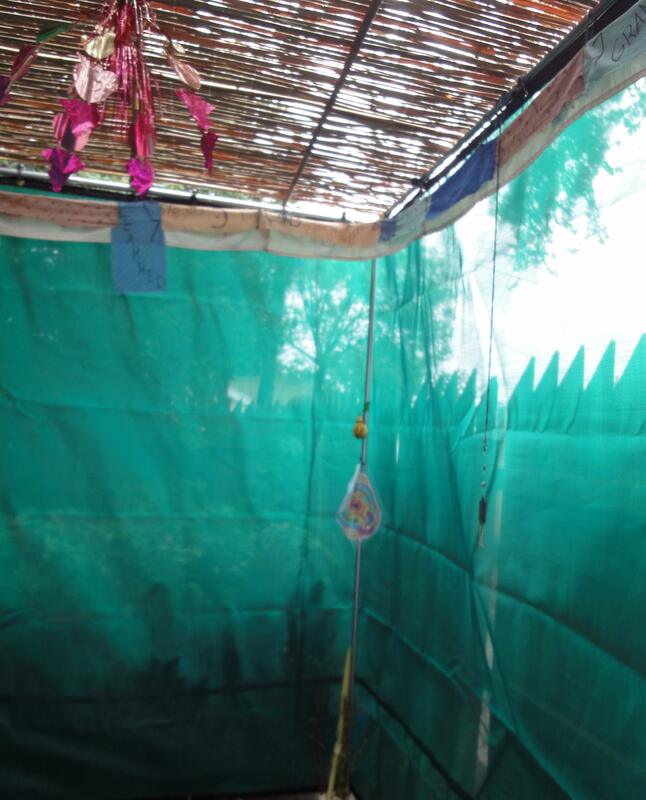 Where does the fragility of your personal Sukkot experience take you? In what ways do you feel protected by a “tent of peace, provided to us by law”? In what ways does your experience reflect exile, as expressed by Machzor Rav Peninim? What about the fragility of the Jewish community, locally and worldwide? And what about the wider world? Are there lessons to be drawn from identifying ourselves and God as together in need of rescue? “ani va-ho hoshi’a na” from Mishnah Sukkah 4:5 is variously translated as “Save Yourself and us,” “I and You, may You deliver us both,” or “Please rescue me and the divine name.” Babylonian Talmud (Shabbat 104a) explains that “ho” is one of God’s names. See commentaries on this prayer in Conservative Siddur Lev Shalem and Orthodox The Koren Mesorat Harav Siddur. Or Hadash: A commentary on Siddur Sim Shalom‘s festival supplement is (available for download here). See also pages 110-111 in Abraham Joshua Heschel’s Heavenly Torah (more here). Many Jews, including the Reform movement, do not observe Hoshana Rabba — or perform the hoshanot prayers during the rest of Sukkot. Posted on October 15, 2014 by vspatz	in repentance, spiritual practice, Sukkot, worship and tagged Joseph Soloveitchik, Oral Law, Siddur Koren Mesorat HaRav, sukkah construction, sukkot. Sukkot is the holiday “most closely associated with the Oral Law,” according to Rabbi Joseph Soloveitchik, as so much of the holiday — from identifying “p’ri eitz hadar” [“fruit of goodly trees”] (Lev 23:40) to determining what constitutes a sukkah — is determined via Oral Law (see below). Taking this thought one step further: Throughout this holiday, we dwell, more literally than usual, within a divine-human collaborative construction. Each year, we erect a new structure resembling the ones our ancestors built but using the materials and hands available to us at the time. Each year, our conception of Torah carries the teachings of our ancestors but makes use of new insights and adaptations to changing circumstances. Sukkot asks us to dwell, for a time, deeply in shakiness: for some this translates into awareness that all depends, ultimately, on God; for others, the focus is on interdependence with others in living through forces far beyond our control. In the sukkah we also dwell, for a time, deeply in an awareness of the human, fallible construction of our Torah understanding and of our abilities, individually and collectively, to put Torah into practice. As we prepare to leave the sukkah, we may hope that next year’s construction will be of even stronger, more beautiful materials erected by even surer hands. But that hope for the future need not throw doubt on the value of this year’s construction or diminish our enjoyment in this year’s dwelling place. פרי עץ הדר with an etrog, the fruit of the citron tree. The Beit HaLevi (Derush 18) suggests that it was on Yom Kippur, when Moses came down with the second Tablets, that the Oral Law was conferred on the people of Israel. But while Yom Kippur commemorates the giving of the Oral Law, Sukkot is the holiday which actually celebrates it. The Sadducees and Pharisees argued about some very basic rules involving the Sukkot festival. Indeed, what is a sukka? What should its height be? From what materials may it be made? The vast majority of the rules of Sukkot are oral traditions from Sinai. Sukkot is therefore the festival of the Oral Law. Posted on September 25, 2013 by vspatz	in ancient ritual, Ecclesiates, high holidays, liturgy, Rosh Hashanah, Selichot, Sukkot, Yom Kippur and tagged Joseph Soloveitchik, Marie Paquet, Psalm 27. “If you’re not 20 minutes early, you’re late,” my ballet teacher, Marie Paquet, used to tell her adult students: Without time to leave behind the outside world and prepare to focus, warm up physically and mentally, class could be frustrating, even dangerous. Over the years, I’ve realized that her adage also applies to worship services. Still, life and public transportation don’t always support early arrival to services. But necessity, as I’m sure “they” rarely say, is the mother of invention in kavanah [intention]…. I wish I could say that this verse instantly helped me find my way into the service. But I can say that I my inability to keep up became suddenly irrelevant. Moreover, I stumbled into a three-part message encapsulating the fall holidays. I am hoping it will carry — for me and others, I hope — the essence of the season of teshuva into the mundane, post-holiday world. Posted on September 23, 2013 by vspatz	in ancient ritual, Community, contemporary midrash, Ethics, God, Sukkot and tagged Arthur Waskow, etrog, four species, Hoshana Raba, Joseph Soloveitchik, Lulav, Sukkah. Each Sukkot morning, many of us stand momentarily with God’s name across our chests, facing away from us, like so many tour guides awaiting the same unfamiliar customer. Posted on October 27, 2011 by vspatz	in Breishit, Ecclesiates, literary analysis, liturgy, poetry, Sukkot and tagged communication, Finnegans Wake, James Joyce, Judy Klitsner, Lulav, Noach, The Place Where We Are Right, Yehuda Amichai. What went wrong at Babel, and how might the situation be redeemed? One answer, I think, is to be found in a whisper still reverberating from our shaky sukkot and the rustling of the lulav. Posted on August 20, 2010 by vspatz	in Devarim, Passover, Rosh Hashanah, Rosh Hodesh, Shabbat, Sukkot and tagged Amalek, Ki Teitzei, kiddush, PrayerLink, Ya'aleh v'yavo, zakhor. Posted on August 4, 2010 by vspatz	in ancient ritual, food, God, midrash, Passover, Sukkot and tagged Hallel, high holidays, Psalms, Re'eh, Shavuot, Sukkah. “You find three verses [two in this week’s portion] that command you to rejoice in the Feast of Tabernacles….For Passover, however, you will not find even one command to rejoice. Why not?” Several explanations are offered in the commentary for the variations of joy-related commandments (there is one command to rejoice for Shavuot). Each explanation suggests important ideas about the calendar, including the upcoming fall holidays, and reciting Hallel throughout the year.